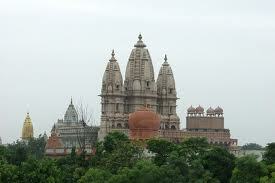 Here is Some Information about Chattarpur Temple in New Delhi. India. 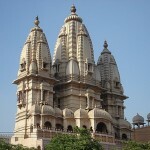 Chattarpur Temple is situated just 4 km from Qutub Minar, located in the Mehrauli area of New Delhi. The spectacular temple complex is an architectural gem in itself.The temple complex is spread over a large area with beautiful lawns and gardens. Though devotees visit these temples throughout the year, the main attraction comes during the Navaratri festival, when devotees come from far and near. 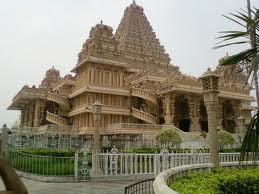 During this time, there are special bus services provided to the devotees.Built in South Indian style of architecture, the Chattarpur Temple complex in New Delhi is spread over a large area with manicured lawns and gardens. Though devotees visit the temple throughout the year, during the Navratri months, people flock from far and near; special bus services are made available due to the rush hour. The cluster includes other shrines of Lord Shiva, Lord Vishnu, Goddess Lakshmi and Lord Ganesh. It is said that tying a holy thread or a bangle on the Kalpavriksha tree (also called Baobab tree/ Adonsonia digitata) fulfills your wish. You must come after your wish fulfillment to untie the thread or the bangle. 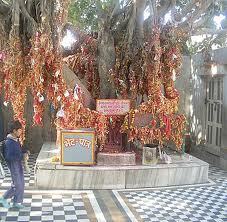 It is believed that tying a thread or bangle on the tree leads to the fulfillment of the devotees wishes. shrines in the complex are built from white marble. 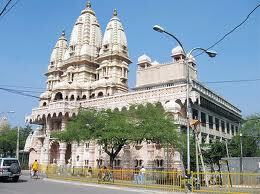 Comparatively recent in its construction, it rivals the splendor of the Mughal architecture of the city. 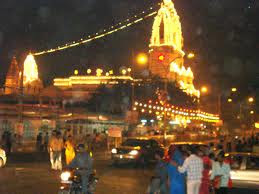 Devotees from all over Delhi come to pay their homage to the deities in the temple. 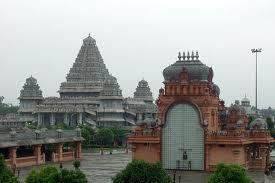 The main shrine is dedicated to Goddess Durga and exhibits traits of the temple architecture of South India. Situated in the capital of India, the Chattarpur Temple is a fine example which presents Delhi a place that has some spectacular Hindu Temples to it’s credit. 4-km away from Qutb Minar, stands the flamboyant and rich temples of Chattarpur. The Gopuram has two storeys separated by a horizontal moulding. The `Prakara` or the outer wall, envelops the main shrine as well as the other smaller shrines and the tank. The Pallavas, the Cholas, the Pandyas, the Vijayanagar rulers and the Nayaks-all contributed to the southern style of temples. 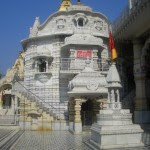 The Chattarpur Temple has been completely carved out of marbles and you will not find any other stone used in the construction.Impressionistic of a modern architecture, the Chattarpur Temple is build entirely out of marble. It is believed that tying a thread around a tree located inside the temple premises, will grant the desired wishes of the faithful. 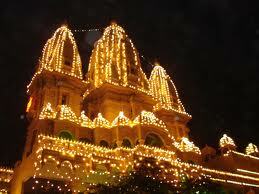 The temple is very richly crafted and has Naqqashi and Jaali work done all over its facets. Though the principal deity of this temple is goddess Durga, the temple complex has many temples dedicated to other deities like Lord Shiva, Lord Ganesh and Lord Ram.The birth of Katyayani is the sixth form of incarnation of Ma Durga and has an interesting story behind it. At one Ma Durga was born to Sage Katyaya who worshipped her and underwent severe penance to be granted the boon of being her father for sometime. She was then sent to earth by the trinity of Brahma, Vishnu and Mahesh and in this avatar of Katyayani, daughter of Katyaya, that she destroyed the demon Mahishasur. After she killed him her fierce persona got another name of Mahishasurmardini or the one who killed Mahishasur. She is often depicted with flowing hair, fierce expressions and golden complexion in this form, used commonly in Durga Puja.On Durga Pooja, one can see never-ending queues of devotees waiting patiently for their turn to ask for the blessings of the Goddess. According to the popular belief, tying a thread on the tree inside the complex of Chattarpur Mandir fulfills one’s wishes. The architecture of the Chattarpur Temple is typically of the Chola and Chalukya style but without the Gopuram (or the decorated entrance door) but the Vimana or the pyramidical tower is richly adorned with naqqashi and jaali work all over the façade. Some of the sanctums like of Mahishasurmardini are opened only during special days like Purnima (full moon days) and Navratri. During Navratris the crowds throng here with great fervor and the daily footfall reaches up to 10 million and around 2 million are fed free of cost. There is a Satsang hall with a seating capacity of a 1000 people, a museum dedicated to the creator of the temple and lush green lawns. The History of Chatturpur Temple blends as the birth of Katyayani who is the sixth form of incarnation of Ma Durga and has got an interesting story behind it. Once upon a time Ma Durga was born to Sage Katyaya who worshipped her and underwent severe penance to be granted the boon of being her father for sometime. Maa Durga was then sent to earth by the trinity of Brahma, Vishnu and Mahesh and in this avatar of Katyayani, daughter of Katyaya, that she destroyed the demon Mahishasur. After she killed him her fierce persona got another name of Mahishasurmardini or the one who killed Mahishasur. She is very often depicted with flowing hair, fierce expressions and golden complexion in this form, used commonly in Durga Puja. It is said that tying a holy thread or a bangle on the Kalpavriksha tree (also called Baobab tree/ Adonsonia digitata) fulfills your wish. You must come after your wish fulfillment to untie the thread or the bangle. The Chattarpur Temple remains crowded during most days of the year, but exceptional crowd of devotees would be seen during Durga Puja and Navaratri. Moreover, during Navratris as many as 10 million people or more reach here from far and wide with great devotion to take a glimpse of the deity, to pray, and to fulfill their wishes. This is the time of the year when special bus services are provided to the devotees to make it easy for them to reach Chattarpur Temple.The ChattarpurTemple is also named as Shree Adya Katyayani Shaktipeeth Temple. 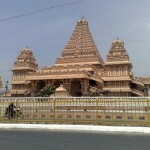 As per Hindu customs, before entering the temple, it is mandatory to take off one's shoes and wash their hands and feet. Prayers and discourses are the regular feature of the temple, which can be attended by anybody. However, the festival of Navratri is celebrated with great enthusiasm and the whole temple is very beautifully decorated and also many hindu festivals are celebrated by the Chattarpur Temple Delhi. By Rail : The Indian Railway with their modern and organized network connects Delhi to all major and minor destinations in India. The city has three major railway stations at New Delhi, Old New Delhi, and Nizamuddin. Luxury trains like the Palace-on-Wheels, Fairy Queen, and Royal Orient Express can be taken from New Delhi Cantonment railway station. Rajdhani Express trains connect New Delhi from the state capitals. Shatabdi Express trains connect New Delhi to the neighboring cities.Nearest Railway Station is Nizamuddin Railway Station and Nearest Metro Station is Central Secretariat and Functional Metro Station is Central Secretariat from the Chattarpur Mandir Delhi.